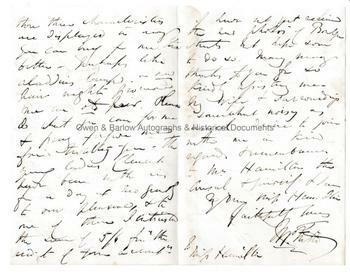 WILLIAM POWELL FRITH Autograph Letter Signed. English genre painter, best known for his painting 'Derby Day'. ALS. 3pp. 7 Pembridge Villas, Bayswater, W. December 18th 1871. 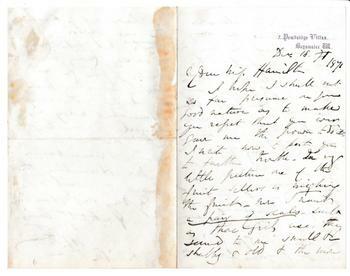 To "My Dear Miss Hamilton". Together with a contemporary engraved portrait by Smythe after Augustus Egg. "I hope I shall not so far presume on your good nature as to make you regret that you ever gave me the power to do it. I write now to put you to further trouble. In your little picture one of the fruit sellers is weighing the fruits. Now I want a pair of scales, such as those girls use. They seemed to me small and shabby and old and the more these three characteristics are displayed in any you can buy for me the better. Perhaps, like Aladdin's lamp, a new pair might . . .(?) an old pair. Please do what you can for me and pray forgive me troubling you. The young ladies Clement have been with us for a day or two greatly to our pleasure, and to one of them I extracted the sum of 5/6 for the credit of your account. I have not yet received the new photos of Boulogne streets but hope soon to do so. Many many thanks to you for so kindly assisting me. My wife and . . .(?) - somewhat noisy as usual - desire to join with me in kind regards and remembrances to Mr Hamilton the . . .(?) and yourself. 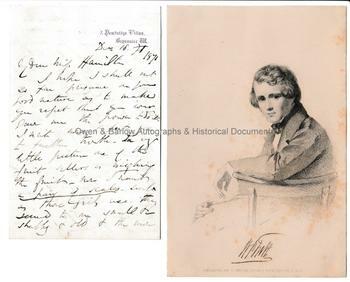 I am my dear Miss Hamilton faithfully yours, W.P. Frith." 12mo bifolium. 15 x 9.75 cms (6 x 4 inches). Old mounting traces to right edge of blank verso, else fine. The "little picture" referred to is undoubtedly William Powell Frith's 'At My Window in Boulogne'. The painting depicts two young ladies with scales and fruit outside a window in a Boulogne street. Frith was clearly at pains to get the right 'look' for the scales and was reliant on photographs of Boulogne for the accuracy of the street scene. Miss Hamilton was presumably the commissioner of the painting. Provenance: From the 19th century album compiled by the family of Dr James Copland F.R.S. (1791-1870), the noted Scottish physician and writer on medicine.